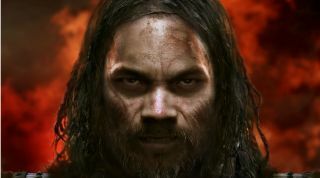 Here's a new trailer for Total War: Attila. I think it was about the Goths, and how they've been driven from their homes by the approaching Huns—forced to travel further afield for the resources they need to survive. I think it was about that, but I was somewhat distracted by all the beards. Seriously, look at all these beards. These are all in-game beards—this latest trailer running on the game's engine. They're... unusual. Like foreign entities clinging desperately to these war-men's face skin. Is this a subtle commentary on aggression expressed through the metaphor of bushy folicles? Or is it that TW:A's engine is tailored for an overhead view that offers less fidelity in smaller-scale close-ups? Probably the latter, to be honest. Er, anyway... Total War: Attila. That's out on 17 February. For more details on CA's portrayal of Rome's end of days, take a peek at this preview.